I have been making artist’s book works for many years – in part as a way to work collaboratively, in part as a way of maintaining a creative practice while employed full-time in academia, but largely because the book form allows experimentation with the interplay of image and text that relates directly to my interest in deep mapping. These are some of the books and catalogues I have been involved in, or which include my work. They have been published by, or can be purchased through, Wild Conversations Press. Details: 17.6cm x 22cm, laser-cut covers, two sections (38 pages each) soft bound within a single cover, colour and b&w images throughout. 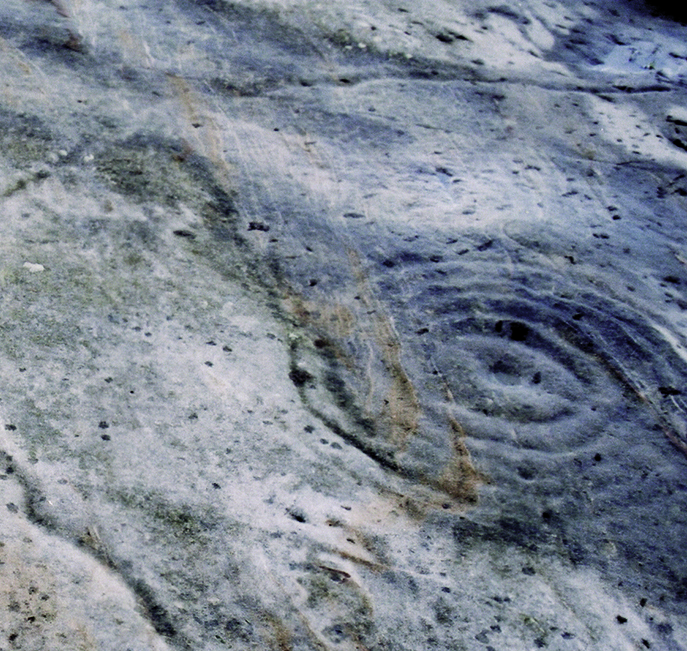 Published to mark the completion of Antony Lyons’ WeatherProof project, one of five Lovely Weather art and science residency projects, undertaken in Co. Donegal, Ireland throughout 2010, as part of PLaCE International’s promotion of ‘deep mapping’ and related geo-poetic strategies. 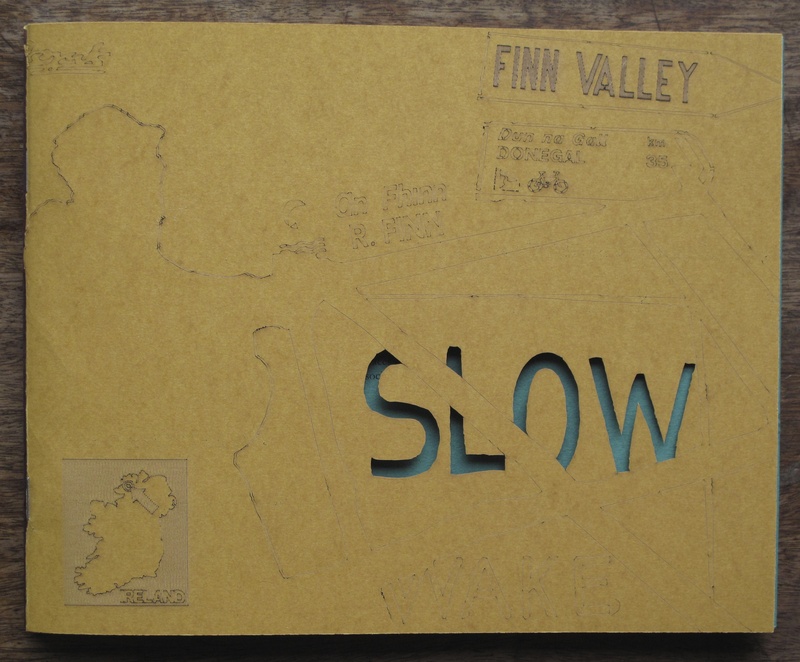 Essays reflect on and contextualize artist and environmental scientist Antony Lyons’ rural science and art residency project, which examining the relationships between the locality of the River Finn Valley, Co. Donegal, Ireland and the processes of climate change. Details: 20cm x 20cm, 58 pages, soft bound, colour images throughout. This catalogue for an exhibition of the same name toured to various venues in Wales, Holland and Germany, contains an essay by the cultural geographer Dr Harriet Hawkins: Making and Meaning: A Geographical Imaginary. Artist / Writers: Mary Modeen, Judith Tucker, Christine Baeumler, Iain Biggs, Laurie Beth Clark, Gülgün Kayim, Rebecca Krinke, Mona Smith, Dane Webster. Essays by: Karen E Till, Iain Biggs, Deborah Sim. Details: 20.2cm x 25.5 cm, 46 pages, soft bound, colour images throughout. Catalogue for two exhibitions – at the Armory and Experimental Galleries – held in conjunction with the Mapping Spectral Traces international, interdisciplinary symposium, held at Virginia Tech in 2010. In addition to images and statements by the artists, the catalogue includes two framing essays: Mapping Spectral Traces by Karen E Till and Deep Mapping: An Introduction by Iain Biggs. Publisher: Wild Conversations Press/iSophia production in conjunction with TRACE. Details: 13cm x 21.5cm, 44 pages, soft bound, colour and b&w images throughout. 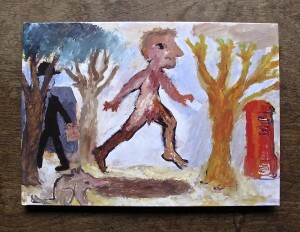 On Mull is the outcome of collaboration between Iain and Josh Biggs. 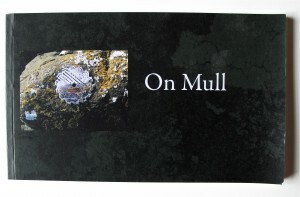 The material for the book was gathered over a short period on the Isle of Mull in the spring of 2008, during which Josh was documenting performance work by the artist Suze Adams. 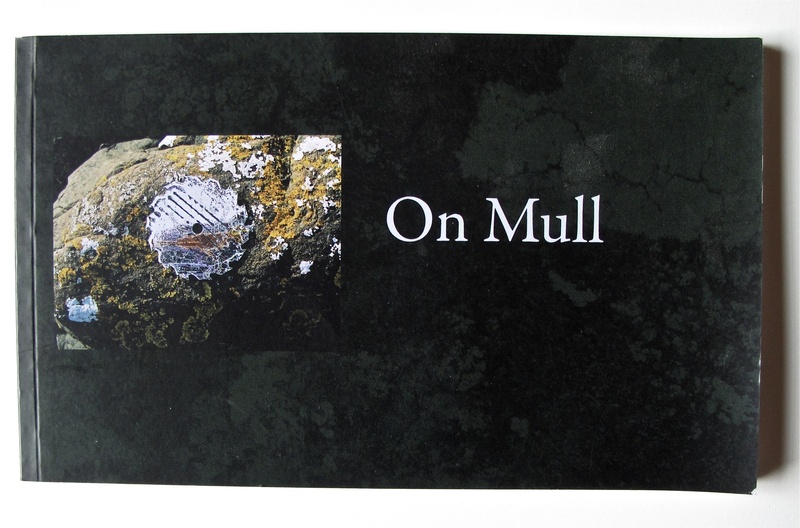 The book combines Josh’s sumptuous colour photographs of Mull’s wildlife and environment with Iain’s sparse black and white images and brief text, resulting in a lightly tensioned meditation on some of the current and historical paradoxes that haunt the island. Details: 13cm x 21cm, 44 pages, soft bound, colour and b&w images throughout. 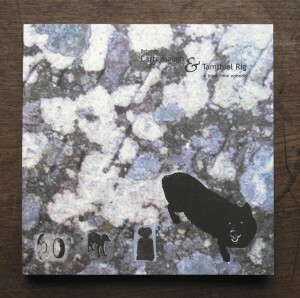 The book also includes a CD of time-based material. This is the second Debatable Lands publication to come out of Iain Biggs’ ambitious Southdean Project. It serves as a creative ‘supplement’ arising from his ‘deep mapping’ project, which has produced three earlier publications – Between Carterhaugh and Tamshiel Rig: a borderline episode, 8 Lost Songs, and Volume One: In Debatable Lands. 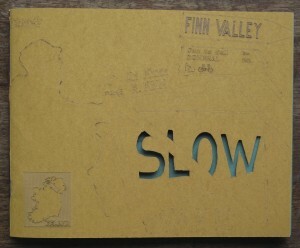 This project, which began in 1999 in the former parish of Southdean just north of the English / Scottish border, has subsequently followed traces of the Borders ‘supernatural’ ballads, spiraled out across the Borders region, to touch on material relating to Ulster and the United States of America. In this book an eclectic group of artists and academics each respond in some way, though images and text, to one or more aspects of the first Debatable Lands publication. Details: 42.8cm x 25.6cm, 90 pages, colour and b&w images throughout. 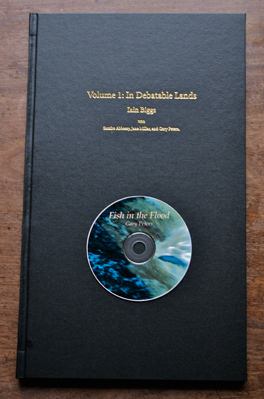 The book includes a CD of music – Fish in the Flood – made specifically for this publication. This is the first of the Debatable Lands publications to come out of Iain Biggs’ ambitious Southdean Project. It serves as a major extension of the ‘deep mapping’ enterprise recorded in the first two publications arising from his Borders work – Between Carterhaugh and Tamshiel Rig: a borderline episode and 8 Lost Songs. This project, which began in 1999 in the former parish of Southdean just north of the English / Scottish border, has subsequently followed traces of the Borders ‘supernatural’ ballads to Ulster and the United States of America. The music CD and visual work of Samira Abbassey and Jane Millar help extend the reach of the Southdean Project, providing both links back into the historical Borders world and an international contemporary cultural context to the mapping. The forty-thousand word text uses a number of different “voices” to explore relationships between identity, place and the ways in which we are or are not “at home”. These considerations are focused around the psycho-political relationship between the Debatable Lands on the English/Scottish Borders and the wider worlds to which this historic area now relates. A central theme running through the book is a concern with matters relating to the process by which the musical tradition of the Border ballads has mutated, particularly in the USA. 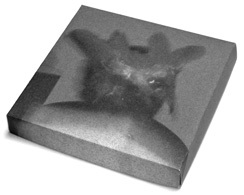 This limited edition DVD, box and booklet developed out of a project by Ruth Jones that formed part of the exhibition Transformations at The Manchester Museum 2003 for which she was commissioned to make a new work that explored masks and identity in relation to the British Museum collection of masks, which was on display in the Museum. For this project, Ruth brought together two concepts connected with potentiality and becoming which have been central to her ongoing exploration of liminal states: the western folklore tradition of the sleeper as someone who lies dormant full of potential, and the crossing of the boundary between the human and animal kingdoms as understood in folklore and magical traditions and more recently explored by the philosophers Deleuze and Guattari. Ruth worked with a group of young teenagers (who are themselves in a liminal state between childhood and adulthood) to make animal masks that reflected a strong innate quality of each individual. A short film was created with the young people wearing their masks in the Mammals Gallery, a Victorian exhibition space full of stuffed animals in the museum. This project evolved into a collaboration with Iain and Josh Biggs (who re-edited the museum footage to include Super8 material and photographs shot by Ruth in Pembrokeshire). A hand made box contains the DVD, a booklet of text by Dr. Iain Biggs and three photographs by Ruth Jones. This is the first of the two early works to come out of Iain’s Southdean project. It takes as its starting-point the traditional Border ballad of Tam Lin, which is explored speculatively in both its historical and poetic dimensions. The book is a hybrid between (auto)-biography, ethnographic research into Tam Lin, an idiosyncratic history/geography of the Borders parish of Southdean and is, above all, a meditation on music as linking memory, place and identity. Although initially recognized as an unorthodox work of ethnography and, as such, short-listed for the prestigious Ratcliffe Prize, it’s style, form and images are oriented by the author’s initial essaying into ‘deep mapping’. Copies of this book, part-funded by the Arts and Humanities Research Council, are in the collection of the Tate, the Victoria & Albert Museum and the Joan Flasch Artists’ Book Collection, John M. Flaxman Library, The School of the Art Institute of Chicago and private collections. This is a strange and beautiful book … about the Border ballad Tam Lin (recorded by Sandy Denny, among others) and its relation to geographical sites in the borders region, and to popular cultures. It might be an essay on the credibility and sustainability of folk stories and songs, a collaboration between the compiler and an anonymous collaborator, A, who is immersed in folk rock and its roots. If I seem uncertain, this stems from the anonymity of A as much as the variety of material, textual and visual, which the book draws together. But just as the pasts, referenced, from mythicized Celtic to documented early times, merge, so the book is about all of these interests. Iain Biggs editor and author, also includes essays by Norbert Lynton and Martha Kapos. Bristol, MakingSpace Publications 24 full colour reproductions, 158 black and white illustrations, 119 pages. 1999 ISBN 1 900999 11 0.